Posted on July 5, 2013 by Elizabeth E.
My little quilt group, The Good Heart Quilters, is having our annual retreat, and has decided to do Debbie’s Polaroid Block Swap. But we wouldn’t mind if a few of you wanted to play. I think we can handle about ten more swappers–but you have to move fast! Our retreat is the third week of July, so you’ll need to mail your intended swap blocks off by the 13th of July in order for them to arrive. Because it’s such a tight turnaround, I’m going to have to limit this to domestic quilters only–no international swapping. Leave a comment if you are interested. I’ll draw from commenters to fill out our swap. I’m not going to reinvent the wheel, so I’ve included a lot of Debbie’s modified guidelines; above is a drawing about how to construct them, or if you like tutorials, follow the instructions set out by Capitola Quilter HERE. We’ll be making JUST the basic polaroid block – 2 1/2″ square feature print with white borders. Important: DO NOT trim the white borders before mailing as it will help the small blocks weather the mailing to wherever they need to go. When you receive your bunch back, you can trim your swap blocks then set them any way you want to. (See some examples throughout this post.) 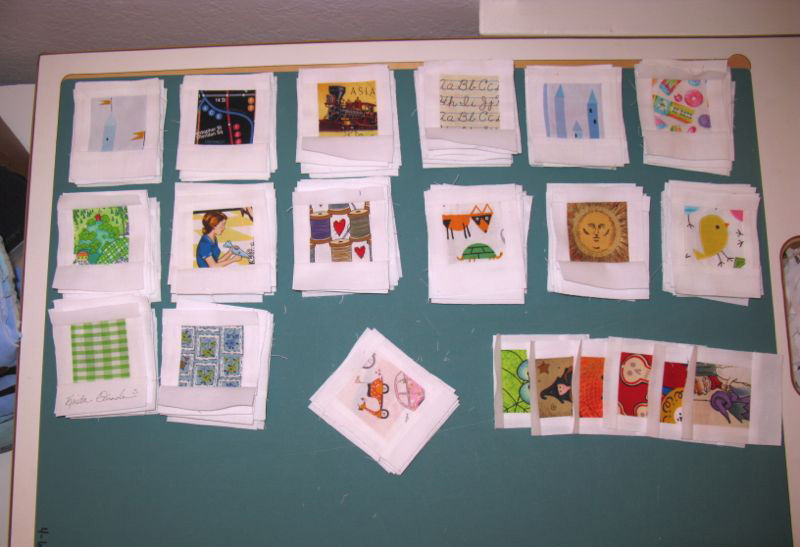 When you see the words on Capitola Quilter’s tutorial that say: “EDIT: If you are reading this post as part of the Perfect Picture Polaroid Swap or Say Cheese Swap- please STOP HERE as they are mailed with the white UNTRIMMED,” you can stop there. Notice in the photo at the top, the top and bottom edges extend over the sides–this is how they are supposed to look. So, in the instructions (image with the summer surfer above), don’t do Step Five. Blocks do not all have to be the same. In fact, depending on how many swappers we have, we’d hope everyone would get a set back with no duplicates. So a variety is good! 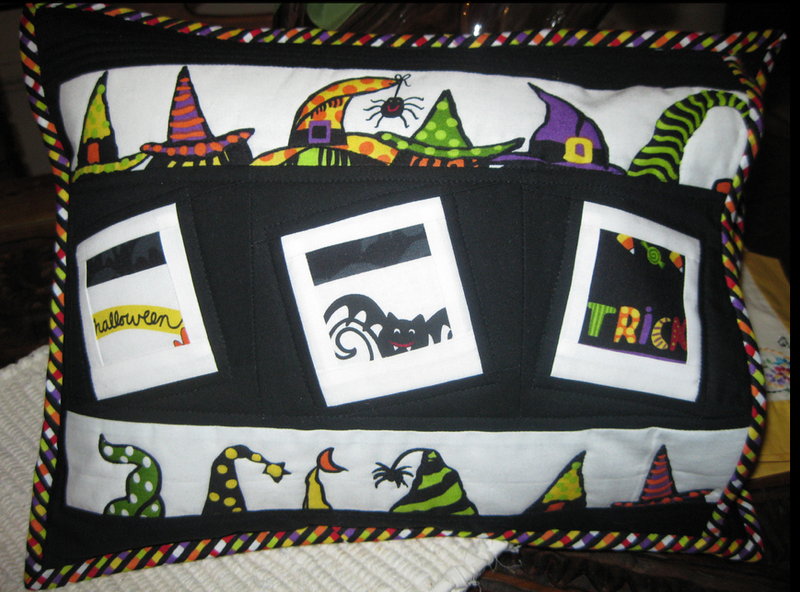 Sometimes some interesting artsy fabric will work for a swap, rather than just relying on all novelties. Please use a white-white for your block borders, such as KONA White (available at JoAnn’s). Let’s swap blocks in groups of 5 – 5, 10, 15 with a limit of 40. Do NOT send me 40 of the same block. Please send no more than two of the same design–we need a variety of blocks for a successful swap. You will receive back a random assortment of blocks – the same number as you send in. I will email you once you sign up, and then when you are ready to mail, email me and I’ll send you my address. When you send them in, put them in a plastic baggie with your name, email address and blog address, so I can keep track of who you are. Include a SASE envelope with your blocks for return mailing. No SASE? I will think you are donating them to my little quilt group, so please be mindful of everyone’s time and send it with your blocks. 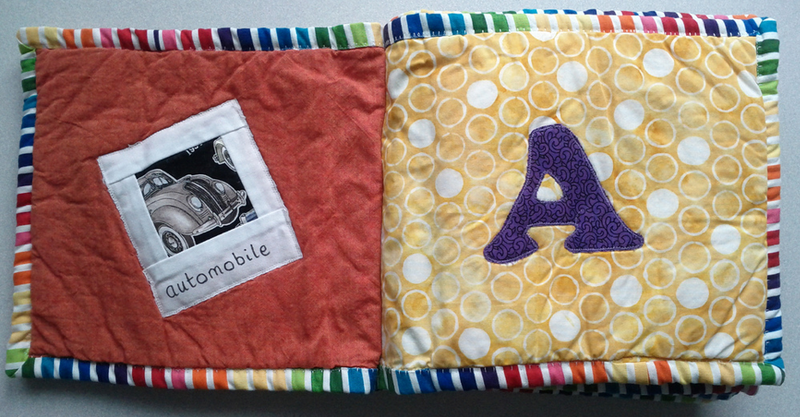 And here is my quilt, Snapshot! 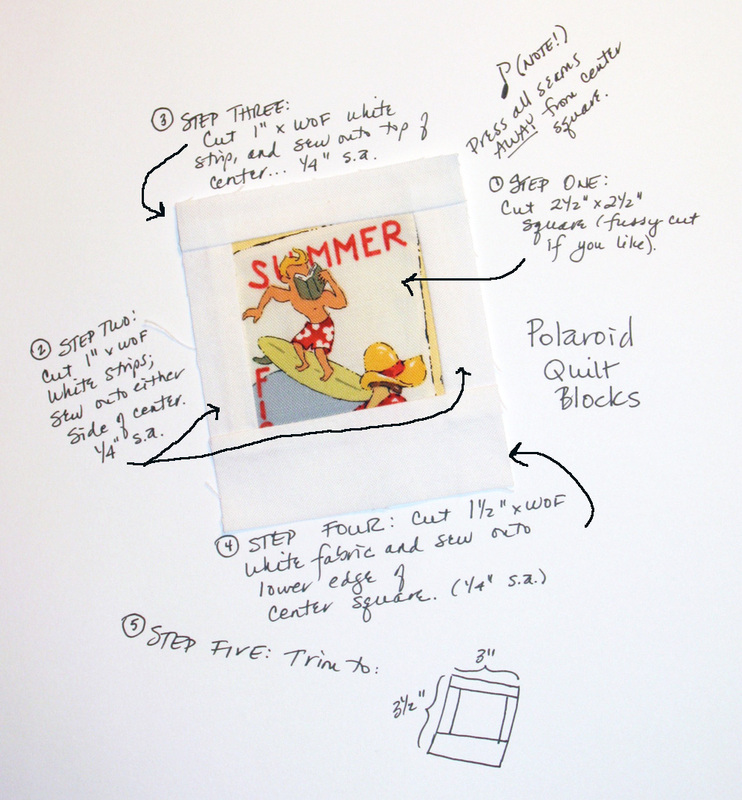 I’ve also pulled some photos from Debbie’s Flickr site with ideas for using your Polaroid Blocks. Enjoy them here, or head over to her Flickr site to see some more. Warning: Making these is addicting! NOTE: When I do trim these up, the top and two side borders are 1/2″ wide after trimming, and the bottom border is 1″ after trimming. 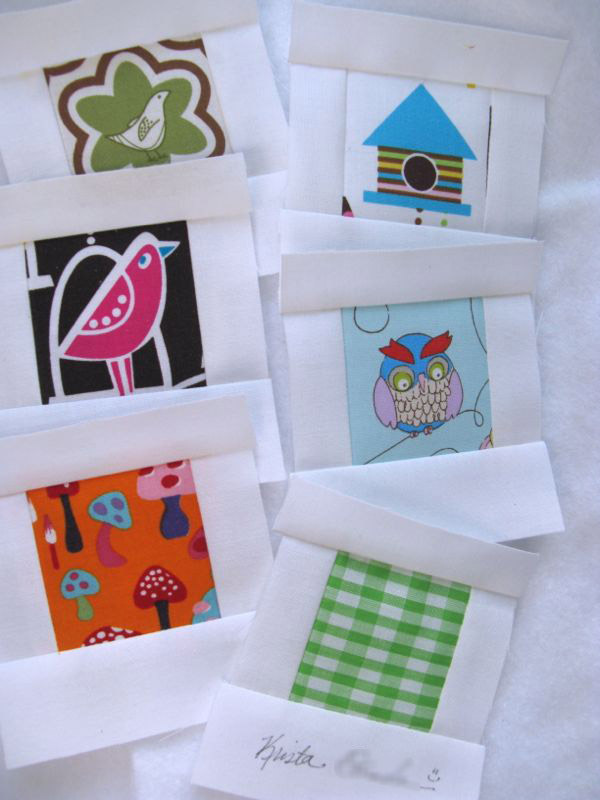 Such a cute idea…..never seen the ‘Polaroid’ blocks before! Pick me! Oh, darn! 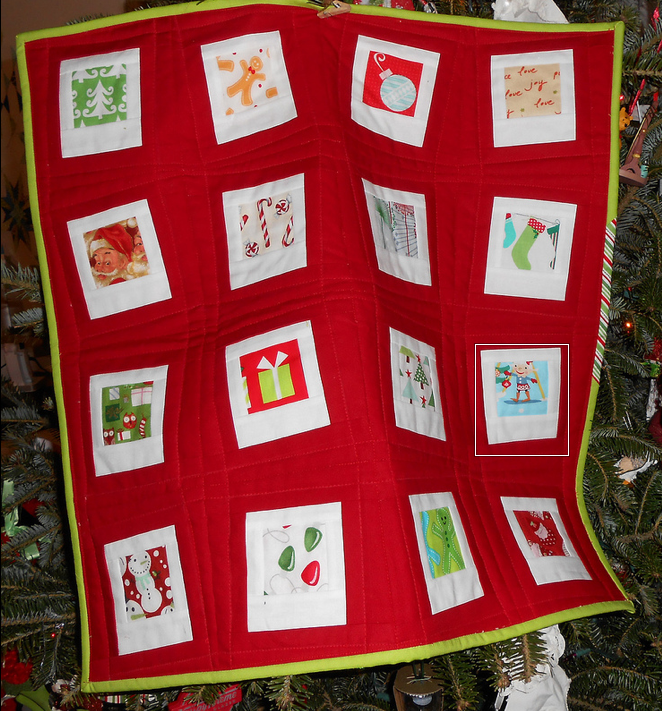 I was already to put my hand up, when I saw ‘domestic quilters’ only! Maybe next time- they look like such fun! You will have fun. I still have my nice little pile of these from Debbie’s swap. You have reminded me how cute they are. Thanks so much for “sharing” this opportunity – I’m in!!! Would love to play, too. Your instructions are so clear! 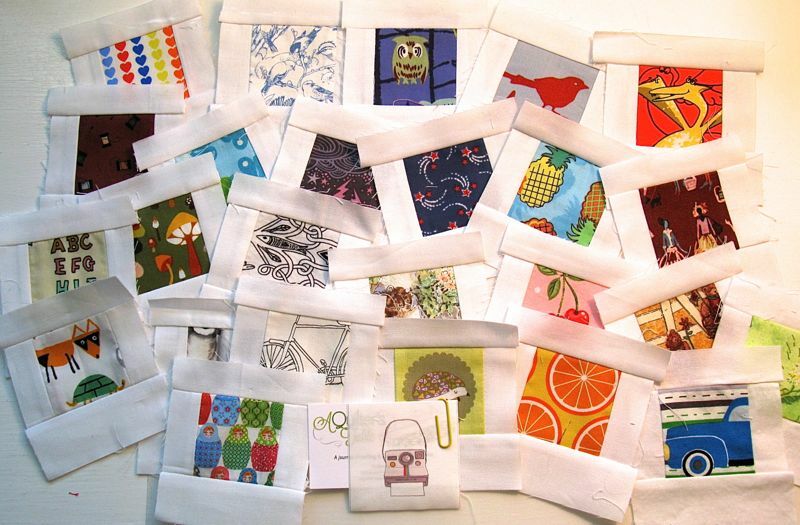 Have fun with the swap – they are quite addicting to make and it’s fun to see some finished projects too. I just love your white board “in a nut shell version” of the instructions. I would love to join in on an international swap. Happy to add a wee treat or coffee cup from down under if it helps to persuade you. I am interested in joining the next polaroid swap. Please keep my contact info for future swaps…Thanks. I’m also interested in doing this – where do I send them to?